A spiral is such a popular topiary shape that some companies sell fake plastic spiral topiaries for use in the entryway of homes. While you can easily purchase a fake spiral topiary, you can also make your own from an evergreen tree with a pyramid shape and dense growth. 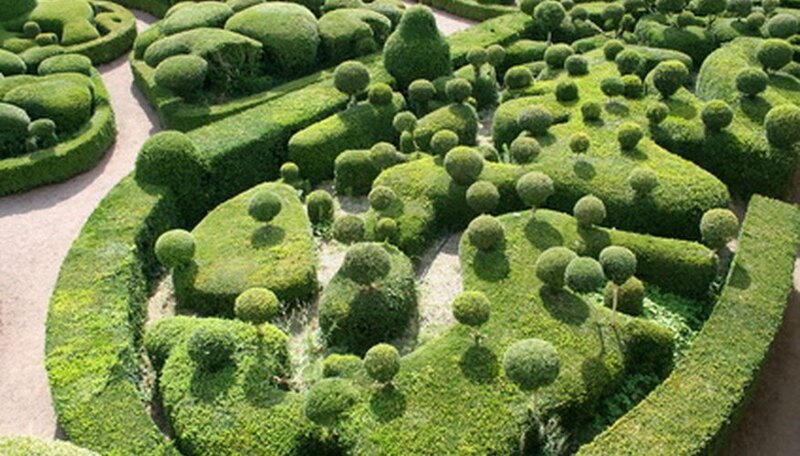 A spiral topiary is a progression from a cone topiary shape. Once you achieve a cone, you simply cut a spiral groove into the shape with hand shears. Choose a plant specimen for your topiary with an upright central stem and a triangular growth habit. Some good candidates include juniper, Italian cypress, boxwood or cedar. Make a rough cut of the plant to shape it into a cone. If the plant’s foliage is not yet dense enough to cut a spiral, allow the plant to grow for 3 months before shaping your spiral. During this time, the plant will branch at the cut ends so that it appears thicker. Tie the end of a surveyor’s ribbon to the tip of the plant at the top of the cone. Observe the way the plant’s branches lay and wrap the ribbon in a spiral around the cone of the plant, much as you would wrap a garland string around a Christmas tree. Make the ribbon drop at a shallow angle at the base of the plant and fall at a progressively steeper angle as the ribbon wraps around the plant. This ribbon will serve as your guide to help you cut the spiral shape into the plant. Step back from the plant and slowly circle it to determine if your spiral of ribbon is spaced correctly over the plant. Make your cuts starting at the base of the plant and working your way upward. With one hand, lift the foliage up and away to give you access to the interior of the tree and allow you to prune away the interior branches following the spiral’s line. Step away from the plant periodically to look at it from a distance and assess your progress. Do this frequently to avoid making major mistakes in trimming. Pinch out the ends of the foliage when you have finished cutting them. By pinching out the ends of the shrub, you will remove the unnatural appearance caused by a hard line cut in the foliage. The pinched ends will also branch and become thicker. Schedule regular maintenance pruning every three months. Never remove more than a third of the plant's total volume in any pruning session. If you cannot achieve a spiral in the first pruning session, spread the training of the tree through clipping over several sessions that are spaced three months apart. Clean your shears with a solution of 1 part bleach and 9 parts water. This solution will sterilize the blades and reduce the chances that you will spread disease from one plant to another. Continue to clean your shears with the solution in between trimming each plant.